During this adaptation phase, the cell will specifically synthesise the elements required for substrate metabolisation. This phase is important when the water has not previously been seeded with suitable germs. No cell reproduction takes place during this phase. 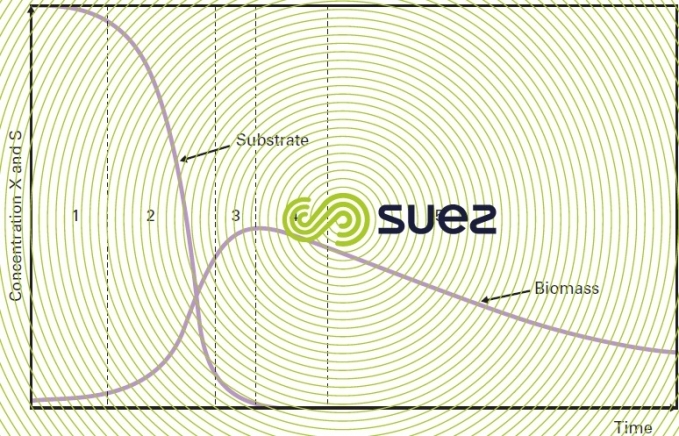 Where μm is the maximum growth rate (typical of the culture and of the substrate) that will be maintained while there is sufficient substrate. This is the phase during which the culture medium becomes depleted, causing the disappearance of one or more of the elements required for bacterial growth. X will continue to increase whereas dX/dt will decrease. In some cases, the slowing down phase may also be due to the accumulation of inhibitor products resulting from the bacterial metabolism itself. X reaches its maximum value Xmax. Overall growth ceases, even when cells maintain a metabolic activity. The cells slowly exhaust their intracellular reserves and as they die, the synthesis balances out. The living cell concentration decreases as the cells die at an increasingly high rate. This mortality is caused by the cells’ enzymatic autolysis. These different phases together with the relevant equations apply to both aerobic and anaerobic environments. Clearly, the value attributed to the different coefficients will depend on the nature of the micro-organisms, of the substrate and of various parameters (temperature, pH, presence or absence of dissolved O2).